Uncle Sam Bean Bag Toss Game! This is a great game to keep the kids laughing, and busy during your holiday party. 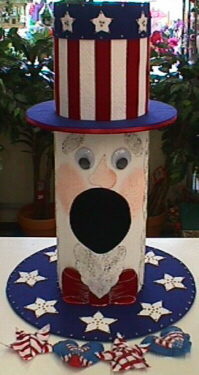 The design can be altered to create a clown, scarecrow, witch, etc., to fit any party theme! From first sheet WHITE felt: Mark and cut 6" from one short edge. and cut 6 small stars. From second sheet WHITE felt: Mark and cut 5" from one short edge. On this piece, trace and cut goatee, eye brows, nose, and 6 large stars. On large piece, trace and cut hair. BLUE felt:From one sheet, mark and cut 2" from one long edge. brim pieces, and two base pieces. 10 - 6"x1" strips. 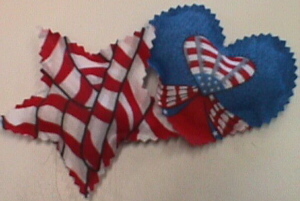 Trace and cut bow tie. BANDANAS: Fold in half. 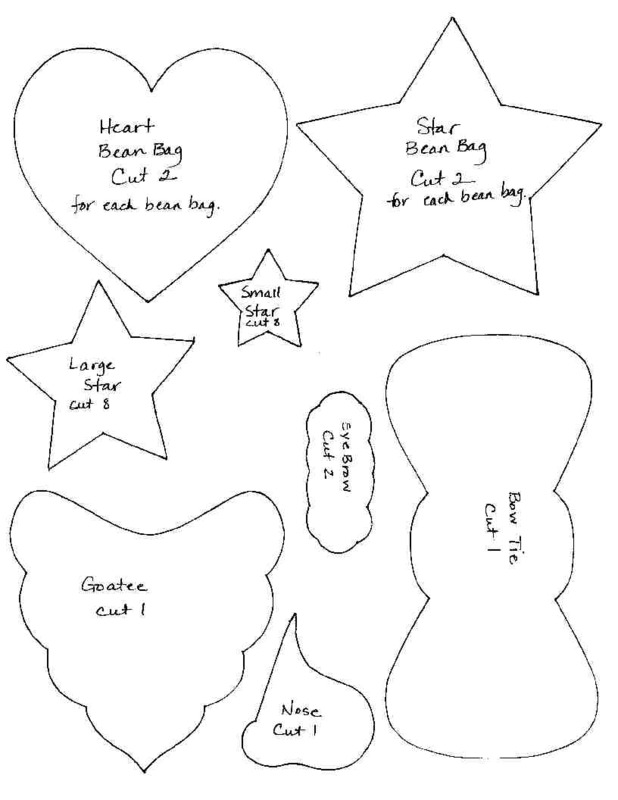 Trace and cut bean bag shapes. leaving a 1" area dry. Place layers together and smooth to adhere. Set bean bags aside to dry. Lightly sponge grey paint on hair, goatee, and eye brow pieces. Set aside. Place a dot of gold glitter paint on the points of all stars. Set aside. With white paint pen, outline and shade bow tie. Set aside. Cut 11 1/2" off one piece of Foam Core. Set aside. Roll this piece into a tube, scored side out. Tape well to secure. out very carefully with razor knife. Color outside edge of base piece with black marker. Fit tube into base. Tape securely from underside. Glue blue base pieces in place, trimming ends as needed to create a tight fit. Hold bow tie piece at bottom front. Mark lightly at top center of tie. away mouth area, beveling edges. 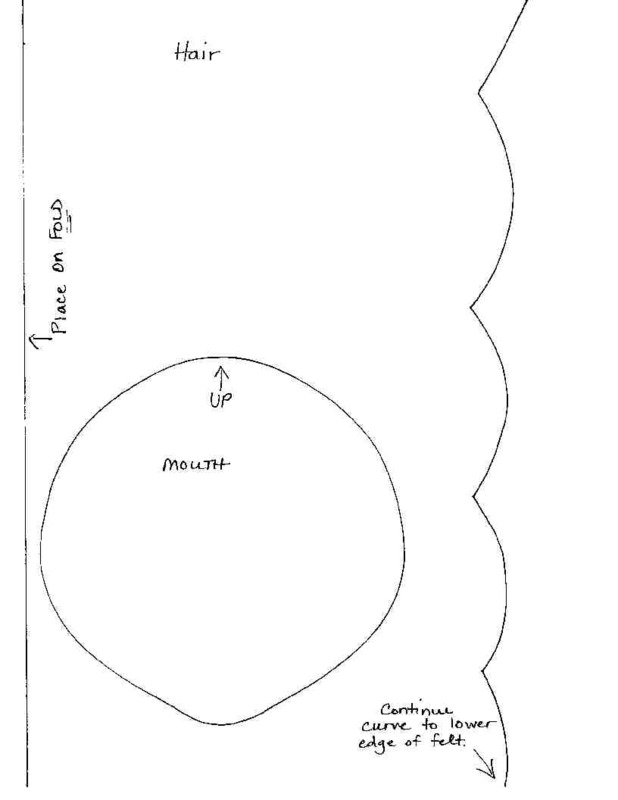 above and below mouth cut out. Press piece in place on tube at bottom. smooth glued area to adhere. Continue gluing either side until piece is secure. Glue bow tie and face pieces in place. Sponge light pink on face for cheeks. Glue hair piece in place in same manner as face piece. trimming as needed to create a tight fit at seams. Glue ribbon to outside edge of trim piece. 2" of face piece. Adjust to find center. push brim piece down to rest on face and hair pieces. trimmed to fit in place. face and hair pieces. Use smaller strip to fill in the back. Carefully cut a bevel around top edge. Color beveled edge with black marker. Glue large stars in place on base, and small stars on blue strip at top. Add silver glitter tri-dots between stars on base and brim. Fill bean bags 2/3 to 3/4 full. Glue openings closed. Trim around bean bags with pinking sheers, if desired. 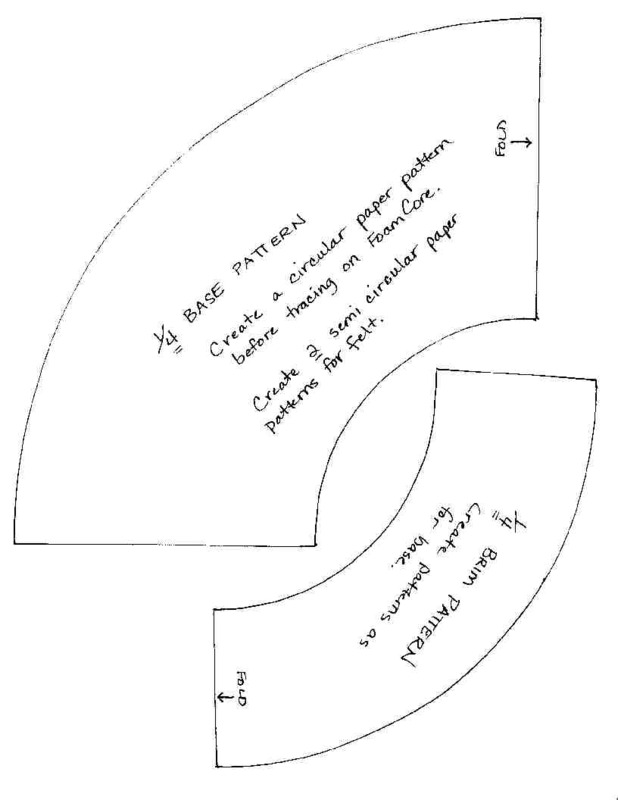 To print these patterns in the correct size, you must set your printer to the Windows monitor default of 96 dpi. If using a graphics program, these pages should be set to print 8 1/2 x 11".